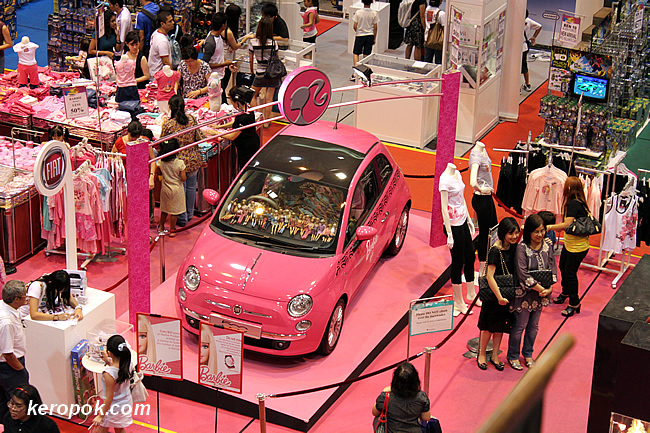 'Boring' Singapore City Photo: What a pink Fiat 500! It's a barbie doll car. It's a gorgeous photo, but I wouldn't want to drive a car that color, either! Pink is not my colour too! Pink is for the fair, fairer, fairest princess! My daughter also does not like pink, even from very young! But, she has a good collection of barbie dolls! I don't understand the fascination of Barbie for little girls (and some big girls,too! ), and try to discourage my granddaughter. It just seems so insipid! I was hoping that the pink was for breast cancer awareness but no such luck. Well, to each his own, I guess. Thanks for this incredible shot that records this particular interest and trend. my greatest pleasure to have met the famous mr. keropok-man! I finally recalled that I stumbled your makan blog from google, back when I was doing some food blogging too. My favourite Fiat 500. I would actually love it in pink! Yeah. You’re right. Pink fiat 500 is like a Barbie doll car...This car is so unique in style. It has different colors and models to choose from. I’m sure you will love this car as much as I do.